The award-winning author/illustrator of numerous books ( Rapunzel, Hansel and Gretel, and Swamp Angel) has created a holiday picture book for the ages, featuring Sydney Taylor’s “All-of-a-Kind Family” and an engaging text by Emily Jenkins (Random/Schwartz & Wade, Sept. 2018). Taylor’s stories were published in the 1950s and centered on an immigrant family living in New York City’s Lower East Side at the beginning of the 20th century. Jenkins and Zelinsky bring these appealing characters to life for a new generation of readers. How did you choose this project? Did you have a personal connection to the original books by Sydney Taylor? Anne Schwartz, the editor of Emily Jenkins’s (and my) “Toys” trilogy, asked Emily if she would try to write a story about the All-of-a-Kind Family family. When Emily happily said yes, Anne asked me if I’d illustrate it. I said yes before Emily actually wrote it. I didn’t grow up with the “All-of-a-Kind Family” books, but both my daughters adored that series when they were young. What is it about these stories that has such timeless and universal appeal? I think it’s largely that these books give you the experience of being part of a big, bustling, functional family, one with huge supplies of love and humor. The stories include anxiety and fear and disappointment and drama—they are stories, after all—but the causes of the painful emotions seem very contained and unthreatening. Besides having such warmth, the books feel tremendously reassuring. And they feature a fascinating slice of long-ago immigrant American life; it’s pretty picturesque. How did you decide on the illustration style and palette? It was just what happened after I gave up my impulse to make the drawings carefully rendered, decorative, and delicate—in keeping with popular art styles of the time. They came out Expressionist. As to the palette, it also just happened. I knew there would be expanses of wood floor, because of the way I laid out the sketches, so warm brown would be pretty central in this color world. In the “All-of-a-Kind Family” books, the sisters all wear the same blue dress, and I tried that in my art, but it didn’t work; distinguishing one sister from another was too important. So I had to choose colors for the sisters’ dresses (showing around their white pinafores) and that along with wall color would account for most of the colors in the book. The palette kind of self-constructed, tending to warm colors that clustered around the hue of the brown floor. Did you do extensive research on the Lower East Side during this time period? Emily did a lot of research and passed much of it on to me. Then I did more. Online, in libraries, at New York City’s archives, and in the actual Lower East Side, which is right across the river from where I live in Brooklyn. Also I consulted with a friend who has done a lot of renovation on old houses like the one in this book. It was all fun to do. You say in the illustrator’s note that you were trying “to represent the qualities of a good potato latke.” Please tell us more. For anyone who hasn’t seen the book, I should note that it’s basically about a four-year-old’s unrealistic and unfulfilled wish to help her family cook potato pancakes (latkes) for Hanukkah. The observation you’re referring to in my note occurred to me only after I finished the illustrations and was writing about how the pictures felt to me. They worked best when they stayed flat (as opposed to appearing three-dimensional and rounded) and rough in texture (as opposed to smooth and polished), and I realized that this description also fit how I feel about potato latkes! Are there plans in the works for any more “All-of-a-Kind Family” stories? 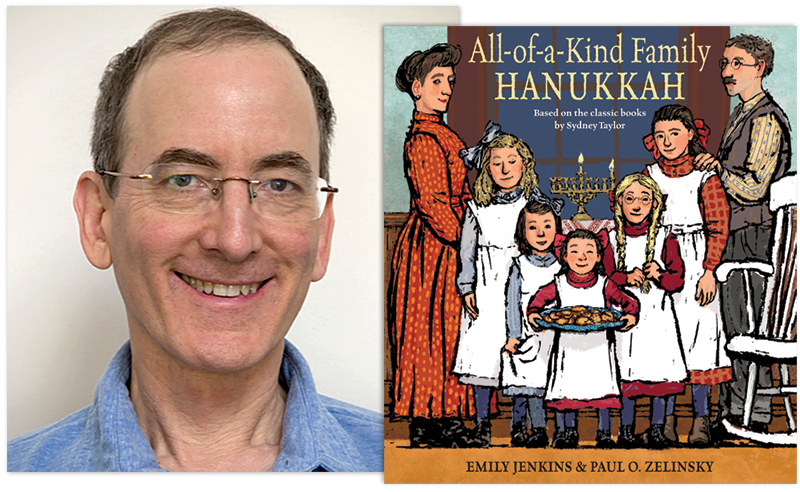 If everybody who reads this goes and buys a copy of All-of-a-Kind Family Hanukkah and then gets all their friends to do the same, there will be a better chance of another AOAKF picture book. At this moment, there isn’t one underway, although a lot of people have expressed the hope. But an unfortunate publishing reality is that series publications need to be justified by sales. So, not yet, but who knows? Luann Toth is managing editor of SLJ Reviews.